Bit of a poo pic, I'll get a better one but you should get the idea. I dont know how but somehow i completely missed this post. Thats a great idea though and ill have to give it a go sometime. 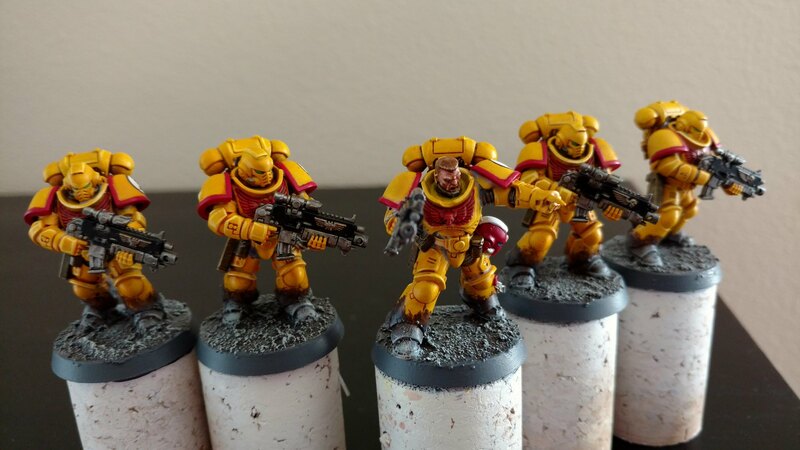 I managed to finish my first batch of Primaris Marines as well, and im very happy with how they turned out especially considering how quickly i got them done. I think a paradigm shift for how I paint is in order. Where once upon a time I would focus on only a specific set of minis at a time I now think that having two or three painting projects going at the same time might be the best solution. It helps if those projects are from different armies as well. Ive found that breaking up the tedium of painting one type of figure with another, especially if it has a completely different style to it helps quite a bit. Ive been working on writing up my backlog but I'm nowhere near finished with it yet but suffice to say its quite a few minis. but here's whats on the painting bench for this month. 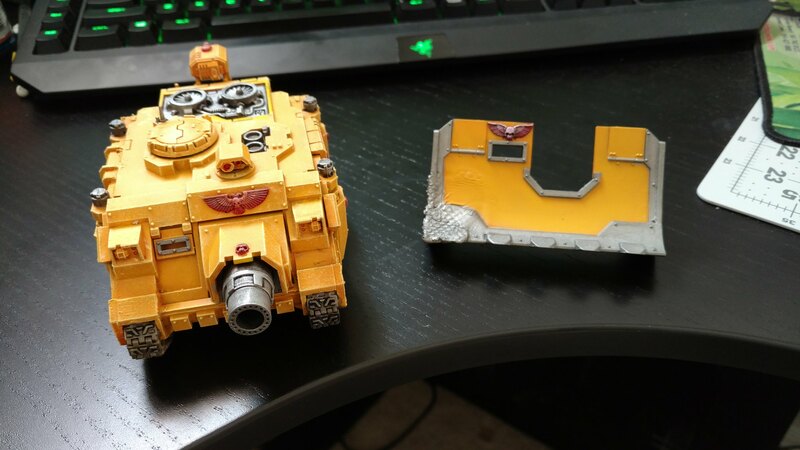 This Vindicator has been sitting idle for years with no paint on it and i figured it was time to fix that. This will be the first fully painted tank ill be able to put into my army as well. Last edited by SwedeMarine; 08-01-17 at 04:34 PM. The yellow is looking sharp! Very smooth! Have you thought about adding some more chipping on the shoulder pads, arms, and greaves to match up a little more with how much muck is on the boots? Either way, looking great! I want to but truth be told I have a tendency to go overboard with that stuff. I did on my earlier squads and while they look good it causes the model to become a little too busy. I might try again when I do an actual tactical squad again just to see how the effect holds up. Any tips for not overdoing it? Less is definitely more with the weathering. I tend to try to only put one or two scratches tops on any given plate, and focus on the sharpest raised edges-- the elbow, the rims of the shoulder pads, and the top of the hand for the gauntlets. It's also pretty easy to soften up the weathering if it's too harsh with a little bit of powdered pastels-- you just have to seal the model afterwards. I'm also a big fan of Tamiya Weathering Master-- you can just work that stuff into recesses with the makeup sponge they come with, and it leaves a great finish every time. Primaris looks really great. Yellow is definitely my favourite colour. I am using small sponge for weathering my models and fine detail brush for thin strokes for scratches. But I don't have so many options on my black marines. @Entarion what kind of sponge do you use? Any sponge-like item will do as long as the structure of the sponge is really tiny. This it totally not hobby related but still cool AF. I have a LOT of fun putting this together. That does look cool... do you have a link for purchase? I always sort of wanted to make a shuttle with the big orange fuel stores, or a USSR version of what you've got! 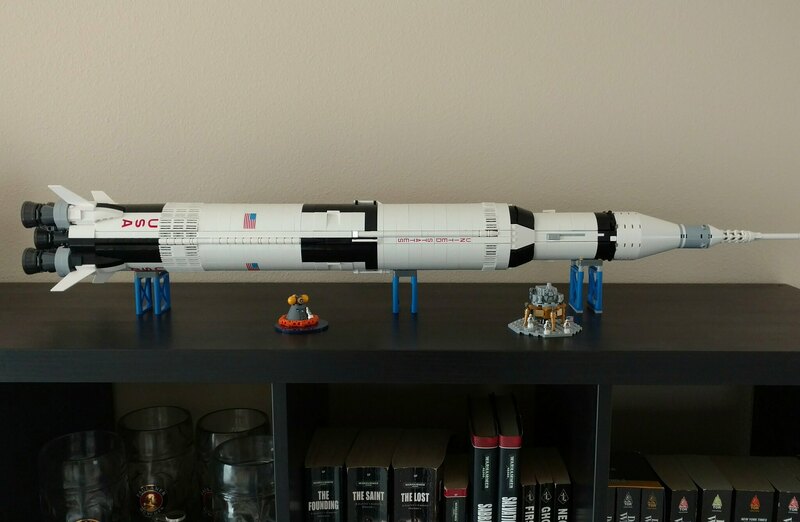 Its the Lego Saturn V Kit. Its been sold out on the online store for months. I was lucky to be one of the few that managed to pick one up from my local Lego Store. They sell out REALLY fast despite being a 120$ Kit. You can find them on amazon or ebay but youve got to pay a markup/ Try calling your local store to see if they have any in stock.